If you visit Prague, try absinthe, a green alcoholic beverage surrounded by myth, mystery, and misconception...one of the most interesting types of spirits in Central and Eastern Europe. Absinthe, commonly called the "green fairy," is a spirit of high alcohol content derived from herbs. Anise and fennel lend it a characteristic licorice flavor, while wormwood is responsible for absinthe’s supposed hallucinogenic side effects; this botanical contains a chemical called thujone. Thujone is regulated in many countries, including the United States, but it is legal in the Czech Republic, where many brands of absinthe are produced. Absinthe originated as a medicinal treatment for malaria and other ills in the 18th century because wormwood has antiseptic and other benefits when prepared properly. However, with the establishment of absinthe distilleries, the drink exploded in popularity, and in the 19th century, it was widely used as a recreational beverage. Visitors to Old Town Prague may have seen the Czechs enjoying the beverage during this period in history, though there’s more legend than truth to its tradition in Prague. Absinthe became associated with the wayward lifestyle of artists and other creative personalities who sought out inspiration from psychoactive substances and alcohol. The thujone in absinthe supposedly caused hallucinations for those who drank it, though it’s widely believed that this effect has been exaggerated. More likely, the high alcohol content was responsible for criminal and other socially unacceptable behavior from absinthe drinkers. The drink’s toxic effects eventually led to a ban on the drink in some countries. Thujone is still illegal in the United States, and this ban has undoubtedly contributed to absinthe’s mystique. Do be warned that ordering absinthe in Prague will mark you as a tourist. 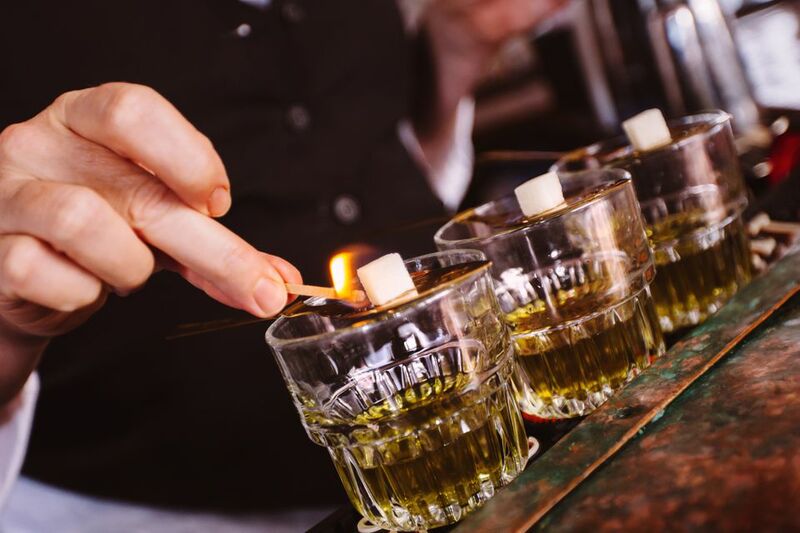 In fact, the whole absinthe industry in Prague was developed to attract tourists, even down to the "traditional" act of setting a sugar cube aflame to melt into the drink. Some, but not all, absinthe in Prague is the Bohemian-style absinthe (or absinth as Czechs spell it without the "e"). These “wormwood alcohols” are made without the combination of herbs, though they do contain wormwood. They are less complex and less pleasant to drink, rendering the addition of sugar necessary for flavor. However, if you can’t stand the thought of Prague travel without trying absinthe, you can at least be prepared. Absinthe is available at most bars in Prague. The drink usually contains between 60 and 70 percent alcohol. Some absinthes advertise by thujone content, which ranges from 10 to 100 mg/l. The highest thujone-content absinthes include Bairnsfather at 32 mg/l and King of Spirits at 100 mg/l. Both drinks are popular and widely available, though some absinthe connoisseurs don’t recommend them. Some distilleries sought to improve the reputation of Czech absinthes, producing them traditionally with attention to ingredients, flavor, and "louche," which is the way the drink clouds when water is added to dilute its strength. Absinthes from the Zufanek distillery get high marks from critics. These include La Grenouille and St. Antoine. Other absinthe aficionados will suggest absinthes based on their similarity to traditionally produced absinthe, their absence of artificial ingredients, the anise flavor, the louche produced before being drunk, and the subtlety of wormwood bitterness. If you order absinthe in Prague, you’ll be given a spoon, a source of fire, a glass of water, and a sugar cube. Sometimes the spoon will be slotted, sometimes it won’t be. The sugar is soaked with a small amount of absinthe, set aflame, then melted into the absinthe. Water is poured into the absinthe, which then turns cloudy. Remember that you’re unlikely to hallucinate after drinking absinthe, but you are likely to get very drunk quickly; don’t plan to navigate maps, or even the metro system, after absinthe drinking. Be safe and try absinthe when you’re within stumbling distance of your hotel...or better yet, inside your hotel.